via Adrienne on Facebook: Warrior Princesses at Pink is for Boys. 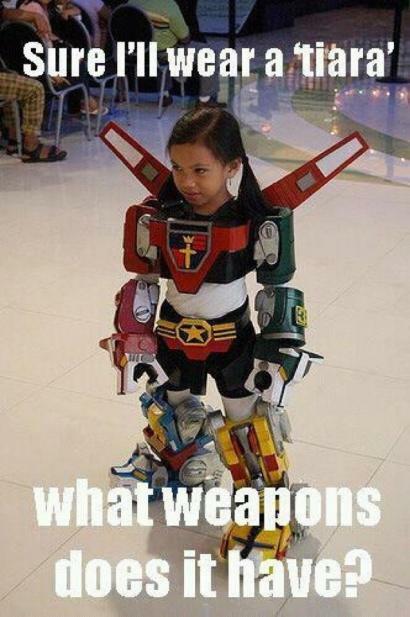 Image description: a girl with hair in pigtails, dressed as a Transformer a Lion Voltron [my sincere apologies ~ M]. Caption: Sure I’ll wear a ‘tiara’ what weapons does it have? Which is important, because the blue lion (the right leg of Voltron) is piloted by a sort-of-tiara wearing princess who shoved her way onto the team because it’s her planet Voltron in defending, dammit. Actually, she’s dressed as Lion Team Voltron. And that I know this, and can recognise it from about three seconds looking at the picture says far too much about my weekday afternoons in the 1980s. Talking about warrior princesses, I was at a comedy show last night where the camp young comic talked about his Xena obsession at primary school, but he kept on describing the show as set in “mediaeval” times. Urge to pedantry RISING.